YOUR BOUTIQUE HOTEL IN BARCELONA. The HOTEL AMRA BARCELONA GRAN VIA is a small boutique hotel located within a modernist building from the early nineteenth century. The hotel is based in the Gran Via de les Corts Catalanes, three blocks away from Paseo de Gracia and nearby the most emblematic buildings of Barcelona. Considered as boutique hotel, its rooms and suites combine modern and historic Catalan modernism, offering guests exclusive facilities, with a perfectly integrated contemporary / modern decor. Newly opened, our 5 types of rooms offer all necessary for turn your stay in Barcelona into an unforgettable experience. 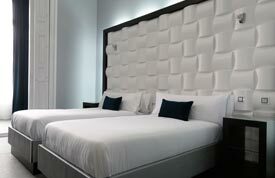 We offer best quality at best price in our rooms with private bathroom in each of them. The hotel also offers a typical Eixample terrace and great views of Barcelona from our balconies. 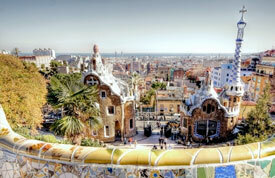 Let yourself be seduced by Barcelona in AMRA BOUTIQUE HOTEL BARCELONA GRAN VIA. Spacious, bright rooms with private bathrooms and the best views of Barcelona. Discover the best places of the city, while staying at AMRA BARCELONA GRAN VIA. HOTEL AMRA BARCELONA GRAN VIA is located in the heart of Barcelona.